KPj wrote: Long post to say "yes, i'll tell you next week when the best time is" but, hey, such is life. haha, good! The FMS is something I'd love to learn a bit more about. I think I'm going to get certified as a trainer over the summer myself so it'll be good to see it in action. Not hogging your ground or anything Kpj, but I thought this would be the best thread to talk about these things. I just met my first client for the first time yesterday. For those who don't read my journal, or read it poorly, our school is having a course, in which we get one client for total of 12 sessions. Right now I'm called "Personal Fitness Coach". My friend and I are seriously considering on starting a business somewhere in not too distant future. He already has a good massage business on his account, so this would add in as a bonus service. Anywho, the client is a student with quite the good condition and sports background. The reasons to apply for this program was to get some sense and clarity for this gym training thing, making a constat habit and a program to follow. The main goal is to improve upper body strength and total explosiveness for sports. What makes things even more challenging, the client informed on the interview that he has some shoulder issues. How bad, I will soon find out doing some shoulder/thoracic mobility assesments. Surely will affect to programming in some sense. We'll see if I have the guts to work on that, or then I just send him to physiotherapist. Dub - no problem at all. I've been side tracked a little from this thread anyway so it'll be good to add to it. Sounds like you're doing well. You'll probably be nervous about the client, I know what I was like when I got my first. Most sports are quad and pressing dominant. Probably not the technical term for it but that's how I think about it. The majority of athletes spend all their time up on their toes and generally need a boatload of upper back work. The convenient thing is - upper body "explosiveness"/strength/whatever and "shoulder issues" quite often need loads of middle/upper back work, too. So you kill a lot of birds with one stone. My experience with an athletic population is limited, though but it's slowly getting better. I've trained a few dancers, amateur basketball player, Thai boxer, Kick Boxer, just about to start training an amateur boxer (hopefully - comp session on Sat), also just about to start training a Golfer who is hoping to go pro (this isn't final either, yet, but i'm positive about it). Anyway, in pretty much all of them, and pretty much anyone, weak middle/upper back. Poor rowing strength, scap stability. Crap abs, no glutes. Usual story, really. I've come to the conclusion that unless someone is making a dedicated effort to get a strong posterior chain, then they have a weak posterior chain, and I don't come across many people who put a focus on that. Actually all "athletes" in my area seem to train like bodybuilders, minus the back and leg days. They seem to either do a whole bunch of bodybuilder-ish stuff and mostly on machines, or a whole bunch of a crazy almost circus like movements in an attempt to try and mimic movements in their sport. Athletes need a foundation, too. What I was trying to say is the shoulder issues might be resolved by doing what the athlete needs anyway. Cheers Kpj, I appreciate your input. And most likely I will harras you again around these issues. But, as of now, I'm waiting for the first session, which involves testing. First and foremost, I will test the clients movement ability by using Gray Cook's Functional Movement Systems Assesments. It will give me a clue about the dysfunctions and compensations the client may have, especially some info about the shoulder issue. The explosiveness will be measured by a Jump of somesort (I was thinking a Countermovement Vertical Jump.) and a 30m sprint. For maximal strength I will most likely use 3RM tests of Bench Press and Barbell Rows, if the clients health and technique is good enough to perform. If not, the maximal testing will most likely be dumped until a proper movement patterns and joint function is achieved. The training program will be around whole body workouts, with progressing intensity towards the end. First learning/evaluating the basic movement techniques. Lots of rowing, and most likely some scap and RC work on the side as well. Intervals once a week for now, teaching the basic methods and principles. just do what every trainer I've ever seen does with their clients: 20mins of kettlebells, 20 mins of TRX then a bodyweight circuit. Then just sit back and cackle malevolently while you think of how you'll spend your money. This actually sounds better than most of the trainers at my gym. They have their clients use machines almost exclusively. If they have them use free weights at all it usually just curls or laterals. In our school, FUNCTIONAL TRAINING is the huge buzzword the tutor and the students are now using. Is this functional? Is that functional? How to make it functional? Then they all go get BOSU balls. It's almost annoying. Atleast I get to do my own stuff without anyone trying to mess with my plans. Dub wrote: In our school, FUNCTIONAL TRAINING is the huge buzzword the tutor and the students are now using. Is this functional? Is that functional? How to make it functional? Then they all go get BOSU balls. It's almost annoying. Atleast I get to do my own stuff without anyone trying to mess with my plans. Functional is relative to what function you want to perform. If you need to move a wheel barrow full of rocks, or carry a couch up the stairs, or push a stuck car, I doubt the BOSU ball stuff will work as well as deadlifts, for example. stuward wrote: Functional is relative to what function you want to perform. If you need to move a wheel barrow full of rocks, or carry a couch up the stairs, or push a stuck car, I doubt the BOSU ball stuff will work as well as deadlifts, for example. I think that's why this whole thing is quite silly sometimes. Is that functional? Gah, Functional to who? For me, Functional simply stands for having a purpose/Using a specific exercise to suit a certain goal. The Bench press is functional for a bench presser..Duh. I don't know, sometimes it just feels like a buzzword. But on the plus side, it has had the effect of bringing more people to free weigths and compound exercises. Yeh, everyone has their own definition of "functional". It's funny, in my gym, because i'm known for working with people in pain or with a lot of limitations, and known to have a focus on posture/movement, people refer to me as a "functional" type. However, i'm also known for "training everyone like a powerlifter" - which I don't but, some people misunderstand me, which is my own fault. I do find it funny how I can be known as a posture/corrective guy and also a guy that makes clients lift too many heavy weights. With that being said, our new fitness manager is a "functional" guy. By "functional" I mean the worse definition. I now call it Circus-Act-Training. He'll do things like - stand on a med ball with body feet, and have someone throw and catch another med ball - you know, because you can generate a TONNE of power whilst standing on a med ball. And he'll encourage people to do BOSU squats etc, and you'll often see him monkeying around on stability balls trying all sorts of weird and wonderful manoeuvres. I can't help but like the guy, though. Disagree vs dislike. He's the best fitness manager we've had for a while. And whilst I take it well when he claims i can't run the length of myself, he takes it well when I ask him if he's training to join a circus. My own definition of functional is being able to move efficiently. I define movement by our primitive movement patterns. To me this is the "function" that humans possess (or lose). Not because Gray Cook or anyone else said so but, because we all learn the same "functions" despite no one teaching it. This speaks volumes for me. How does the 3 year old squat so well without being taught??? One of those things that just "make sense" to me. Research is in it's early stages but, I just intuitively believe in it and i've not seen anything else that does the job any better. 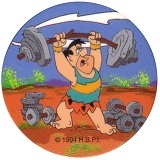 In this regard, the basic free weight movements "cement", or maintain these primitive patterns. And strength training is just awesome for a number of reasons and in my view should be a part of any program regardless of the goal even if it's not the primary goal of the program. You free over the next weekend or two to teach me to front squat? A little aside, i've got some "haterz" in the gym now, which I take as a compliment. I've avoided this "group" in the gym as much as possible since I started working there. They're just bitter, basically. I also know pretty much everything I do is in their mind completely backwards/contradictory which gives me some satisfaction. I knew one in particular had a negative opinion of me, or better put, my "methods" months ago when he was trying to tell me how to get stronger (basically, he told me to do German Volume Training, which "trended" in my gym, for a few months). Worth noting i'm very passive in these conversations, nod smile and try not to keep it going. This is also related to the now exiled steroid-head that I had a run in with if anyone can remember that. Same group. It's also a group of people who used to try and help a client i've now trained for 1 year. She's now my strongest-ever female client. Basically before me, she tried everything you can think of, and trains her a$$ off, more than most people I know, even trainers. She used to constantly get advice and to be honest, a lot of really negative comments made to her/about her. When word got around that I was going to start training her, I literally had 4-5 people come up to my at different times saying, "what are you going to do with her??? I think her problem is this, and she needs some of this, and that, and the next thing". I was her last resort. She had also tried a few trainers before me. I answered them all with, "i don't know, i've not done her consultation yet, and I don't know what she wants, don't know where she is, don't know what she wants to achieve, so I don't know anything". The girl originally joined the gym to help control weight GAIN after a long battle with an eating disorder (Anorexia). She joined the gym because she was gaining too much fat. It was to minimise that and, lose some if possible. To this day, 1 year on, not one of them have asked me about her training. Which means they all think i'm nuts. Which is good. Anyway this guy talks away to a couple of my clients and has started being quite critical of how I train them. He appears to have a problem with progress, as one client put it. I just told the client not to rise to it, said he just doesn't understand me and that's probably more my fault than his. I wasn't all humble, though, adding that some men may feel a little insecure knowing the women they are talking to can deadlift more than them. Bean-Bag-Head-Goblet-Squats-With-Sandbag. The "with sandbag" is actually a progression from the basic Bean-Bag-Head-Squat. To do this you put a weighted bean-bag on your head and squat without it falling. If this goes well, you hold another bean bag in the goblet squat position. If this goes well, you then get to have a sand bag draped across your shoulders. It's a big ball of Awesomeness all rolled into one squat variation. I kept a very serious tone when coaching it and the client had a face of intense concentration. Then we performed bean-bag-swing-tosses. Stand about 8-10 feet apart and do a swing with a bean bag, but thrust the bean bag out of your hands with deadly hip drive propelling it towards the other person. The other person catches it mid-eccentric-swing, quickly gets control, and re-propels the bean bag on the concentric of their own swing, returning it. Just repeat till exhaustion. haha, you got me there. Would need to be next weekend - Saturday afternoons are nice and quiet just now? lol at that beanbag thing. You'll turn that client into a youtube sensation if you're not careful. Well how about Saturday the 3rd for some squatting?